They LOVE Our Native American Beauties in England! 25 Jul They LOVE Our Native American Beauties in England! When I worked with Carolyn Mullet of Carex Tours to plan my custom garden tour to England, I asked to see some classic National Trust gardens, private gardens, a village, and some gardens designed or inspired by Piet Oudolf and the New Dutch Wave. She nailed it! I was astounded to see so many familiar plants native to my country used in great abundance everywhere, even in the classic borders. Helenium (shown above) is a wonderful perennial for this time of year. It laughs at the heat and keeps on blooming. In the background you can see masses of Veronicastrum virginicum (Culver’s root) which was also in nearly every garden we saw. 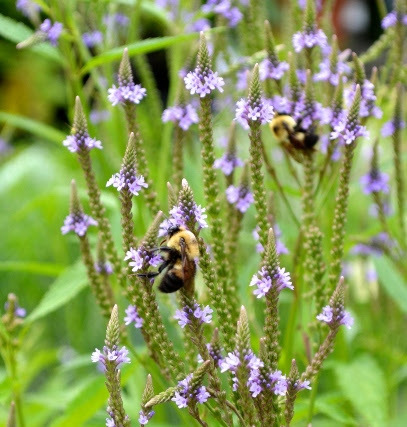 Vervain (Verbena hastata) was woven in, an ideal pollinator plant. Echinaceas, Rudbeckias of every sort, and many of our native grasses such as Panicum swayed in the Cotswold and Kent breezes. All of the hedgerows on the side of the ridiculously narrow roads had massive elderberries growing in them. When I came home I saw mine were beginning to ripen- elderberry syrup making begins next week! Bee balms (Monarda) of every size and color, goatsbeard (Aruncus, especially the variety ‘Horatio’ which they seem to love), Asclepias, goldenrods, asters… It was truly astounding to see how the English (and the Dutch and Germans too) so love our plants! If you want to hear all about my trip to England, mark your calendars for our very first potluck lunch on Saturday, July 30th from 12:30-2:00. This will be following our monarch butterfly talk. Be there!